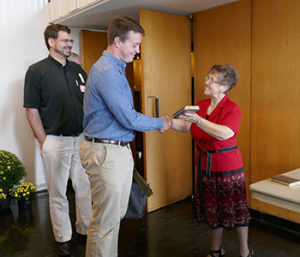 The mission of the Concordia Theological Seminary Guild is to serve God by communicating the needs and encouraging the support of the seminary and its students. God’s grace enables us to pray, to encourage men and women in our LCMS congregations for the ministry and the deaconess program, and to support the Seminary by providing for its spiritual and physical needs. Women served Christ in many ways during his time on earth, and their service has continued in the Church to this day. The needs have changed, as have the methods of caring for God’s servants, but the mission has not. We support men and women preparing for the pastoral and diakonal ministry, as well as the worldwide vision of CTSFW to equip servants for the church around the globe. We are women of a variety of ages and backgrounds who work together to provide for the physical and spiritual needs of CTSFW’s students in a number of ways. 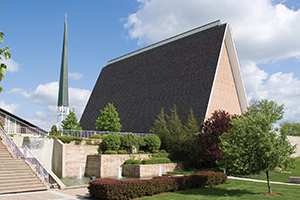 Over 20 congregations in the Fort Wayne area are represented in the Guild. By combining our efforts we can make a greater impact on these future servants of Jesus Christ who will teach the faithful, reach the lost and care for all. We would love to have you as a Guild member! There are two ways to join the Seminary Guild. For those living in the Fort Wayne area, we offer individuals memberships for $10. If you’re a Bible Study Group, Circle, LWML, Altar Guild or other group in an LCMS congregation, consider becoming an organization member for $25. In order to celebrate each dorm students’ birthday, they receive a skillet cookie from the dining hall at the beginning of their birthday month. A special birthday greeting is also given to them from the Seminary Guild. During Finals Week of each quarter, we provide snacks for the coffee break that takes place after morning chapel service. We make homemade t-shirts and booties for all new babies born to our students. Receptions are hosted throughout the academic year, including Opening Service, Vicarage Placement, Call Night and Graduation. We recently purchased new furniture for Students Services and the Dean of Student’s Office. The Seminary Guild membership voted to donate $4,500 to this project, creating a more inviting environment for the students. We also have the annual and ongoing “Legacy Project,” which provides every new diaconal and pastoral student with a copy of the “Pastoral Care Companion,” given to them on the day they receive their fieldwork assignment. Though the book has “Pastoral” in the title, it is appropriate for both male and female churchworkers as it contains prayers, readings, hymns, and liturgy that guide those caring for individuals in times of both celebration and distress. 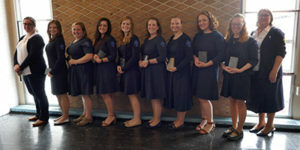 At the end of every academic year, we also give gifts for the wives of our graduates as well as to our deaconess graduates.